The Orient Express first started operating in 1883 under the Compagnie Internationale des Wagons-Lits and is known for its route from Paris to Istanbul. Even though the original Orient Express stopped its journey in 1962, today’s Venice Simplon-Orient-Express is the closest one can get to head back to this era of unhurried transport and luxury service. Recreated by James Sherwood, founder and chairman emeritus of Belmond Ltd, by buying original carriages from Orient Express auctions, the VSOE is now a luxury sleeper train with fine dining, excellent service, and the occasional murder party. The Venice Simplon-Orient-Express has everything the Orient Express once had, from the iconic route from Paris to Istanbul with exciting new stops such as Vienna, Budapest, and Prague, to its service once adored by aristocrats, royalty, writers and stars at the time. From the moment you embark you are transported as if back in time. Each carriage has its own personality and every detail is precisely designed to make this a once-in-a-lifetime experience. As for meals, dining on board has nothing to envy to any 5 stars restaurants, with French chefs cooking exquisite courses with fresh ingredients, served by elegant and discreet Italian servers on sumptuously dressed tables. No details are overlooked to enhance the experience: fine linen, French silverware, crystal glasses, fresh flowers and tasteful decorations at every table with the finest champagnes or wines chosen specially to suit the taste of the dish. With its new cabins, the VSOE has reached new levels of luxury: the 3 Grand Suite cabins, named “Paris”, “Venice” and “Istanbul” and each uniquely decorated, offer a uniquely fine service. They offer the comfort of a double bedroom, a private dining area, and an en-suite bathroom with a toilet, a washbasin, a shower, high-quality toiletries products, and designed bathrobes. From your cabin, you will be able to admire Europe’s most breath-taking landscapes while savouring champagne and tea brought by your personal steward through a journey precisely crafted so that the most beautiful sights are passed during waking hours. But it’s most importantly from its out of time atmosphere that the VSOE is praised all around the world. 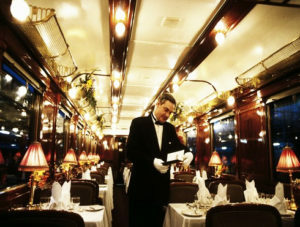 Passengers are encouraged to dress up for dining in suits and evening dresses, and the main social hub of the train is the train’s iconic Bar 3674 car where you will be able to enjoy unique signature cocktails while playing cards, reading or gossiping accompanied by the cars’ talented pianist’s music. For more information see sleeper trains for further details.